“Mary Shelley,” a swoony but tough-minded bio-pic about the author of “Frankenstein,” is an inspired match-up of subject, filmmaker, and star. As we’re reminded late in the film, Shelley was 18 — 18! — when she published the 1818 novel that ensured her fame and that remains a foundational work of both modern literature and popular culture. Elle Fanning, the actress playing her, was 17 when the film was shot, and the movie benefits immeasurably from Fanning’s combination of youthful softness and creative spine. The director, Haifaa al-Mansour, is the first woman to have shot a feature in her native Saudi Arabia, with 2012’s “Wadjda,” about a little girl desperate to buy a bicycle she’s forbidden to ride. The stakes in “Mary Shelley,” of a woman bringing forth her monstrous artistic vision in a society of unprepared and dismissive men, feel close at hand because, for many, they still are. Didacticism takes a back seat to the life, however, and to the storms of melodrama surrounding it; if “Mary Shelley” disappoints, it’s only because al-Mansour sticks to the tried and true bones of the bio-pic genre and plays it stylistically safe. Maybe the filmmaker hopes to prove her skill with a big-budget period piece; if so, she easily succeeds. But the most radical message of the film is textual — that the “Modern Prometheus” of Shelley’s novel’s subtitle, the abandoned and inconsolable monster created by Dr. Frankenstein, is none other than woman herself. 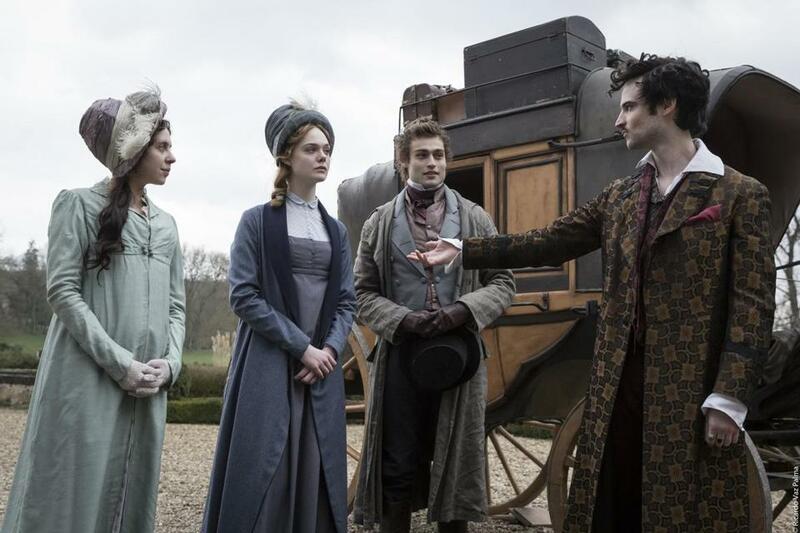 The film introduces the rakish young poet Percy Bysshe Shelley to Mary Godwin’s world as if he were a teen idol descending from a “Twilight” poster; actor Douglas Booth’s mussed and moussed good looks are part of his allure as well as part of the joke. The smitten couple run off along with Mary’s stepsister Claire (Bel Powley of “The Diary of a Teenage Girl”), whose dedication to free love is more far-reaching, if less thought through, than Mary’s. Dispossessed by her father, pregnant, often penniless, Mary is soon witness to the bleaker side of the era’s Romanticism. “Mary Shelley” takes minor liberties with known events and compresses a few children into one, but it has fun dramatizing the influences on Shelley’s coming creation: her husband’s fiddling with scientific flasks, a visit to a traveling “galvanist” who zaps a frog back to apparent life, Mary’s unyielding grief over her dead child. And it shows how the ground broken by these fine young rebels mostly benefited the men. The wealthy men, especially. Portrayed by Tom Sturridge as a sort of upper-class glam shocker, Lord Byron gets to bend the rules because he has the money and the title, and he brings the starry-eyed Percy along in his wake. When a prolonged rainy spell during an Italian villa getaway leads to Byron’s famous dare — that the company while away the time by each writing a ghost story — only Mary and the gentle amateur Dr. Polidori (Ben Hardy) actually rise to the occasion. It’s hardly a coincidence that Shelley’s “Frankenstein” and Polidori’s “The Vampyre” were both initially believed to be the work of other writers, Percy Shelley and Byron respectively. The meat of “Mary Shelley” comes in the film’s final act, when the act of writing “Frankenstein” — and the societal complaint buried beneath its monster’s shroud — emboldens Mary to claim authorship and identity for herself. Again, the director and her star make their point under the meticulously appointed cover of the film’s 18th-century setting, but they make it plainly, cleanly, and with fire. Fanning appears to physically grow into her role as Mary Godwin grows into her stature. “Soon Mary will write a work that will surpass all of us,” Percy Shelley informs his friends in one scene, with a gifted husband’s condescending pride. We know he’s telling the truth, though, and you can tell by the look on his wife’s face that she knows it, too. Directed by Haifaa al-Mansour. Written by Emma Jensen and al-Mansour. Starring Elle Fanning, Douglas Booth, Bel Powley, Tom Sturridge, Stephen Dillane. At Coolidge Corner. 120 minutes. PG-13 (sexuality and thematic elements including substance abuse).